+ If your oppenent change of heart this mon, and discard then you still get the effect. RFP: Well, it is one of those effect monsters with a decent attack and defense. 1100 attack isn't to bad for late game, and 1200 defense is just bad...=/ but it gets the job done to get you a monster with 1500 defense or less. Thats always good to get your summoned skull, la jinn or any other effect monster you might need. Another good thing about Witch of the Black Forest is that if you change of heart it, and discard it the OWNER gets to use it, because it goes to his or her discard pile. You can also get Exodia pieces with it. And the faster exodia comes out the faster you win. And finally you can get cards like summoned skull and any effect mon that you need. This card just adds speed to the game. RFC: The only real con to this card is that it has low attack and defense so that it wont stay out on the field very long. WoTBF + low defense monsters= going through your deck to find your somewhat big attackers, and effect monsters. Horn of Heaven + Witch of the black forest= kill a mon to get a mon. Those are just some of the basic combos. This card is very good, and will get better. Soon it will be restricted one per deck. Good, solid monster search. WotBF is a great card for decks based on Summoned Skull, Exodia, and others. Witch of the Black Forest allows you flip it to search your deck for monster with 1500 or less DEF. This is great because it enables you to search out many of the powerhouses such as Summoned Skull, Dark Elf, 7 Colored Fish, and more. You can even search your deck for most of the weaker monsters with strong effects. Such as Man-Eater Bug and Magician of Faith. With WotBF you can create numerous mini combos during gameplay. Exodia based decks is where this card shines. Since all the Exodia parts are very weak, Sangan and WotBF can both search your deck for any piece. Soon, when a few more support cards are released, Exodia will be a strong deck in my opinion. WotBF is a good card that is pre-restricted for a reason. Witch of the Black Forest is next. Restricted down to two, and why? Because it’s draw power. All the biggies- La Jinn, Summoned Skull, 7 Colored Fish, they all can be draw from the Witch. Basically any beatdown monster can be drawn with it. In any case, it does have a moderate attack power, so you can pit it up against other weakling effect monsters or just play it in attack mode and let it die. It’s not a flip so you get the effect weather it’s face up or down. It also gives a nice little lp damage boost. 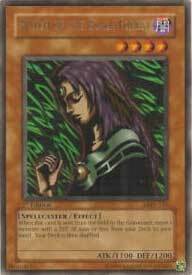 In F/S beatdowns, you run this card before any Neos or Oxes. These guys help you get the better attackers- La Jinn and 7 Colored Fish. But, again, its pre-restricted so, only two. Last Will + Cannon Soldier + Witch + (effect) Cannon Soldier + (activates Last Will) Search Witch/Sangan + (effect Witch) Search Exodia + (Flip) Magician of Faith + Gain Last Will + Last Will + (effect) Cannon Soldier + (Activate Last Will) Search Sangan/Witch + (effect Witch/Sangan) Search Exodia + (effect) Cannon Soldier + (effect Sangan/Witch) Search Exodia. Hella long and complex, but most exodia decks run around this combo. The nice thing is, though, that you can add or subtract to the combo as needed. Rating: 4.5/5 ­ Searching r good.